Well, well, another Canada band. I’m not sure what is going on up there but they are obviously a breeding ground for all types of metal. 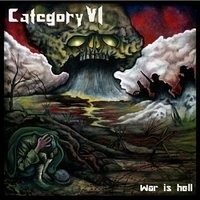 This time the country of cold is spitting out a power metal band named CATEGORY VI. This album, their second full length, is a power metal tour de force. Although I don’t think they sound like either band per say, they do give off a classic metal vibe like JUDAS PRIEST or MERCYFUL FATE. Vocalist Amanda Marie has a deep set of lungs and she uses them ten-fold on this release. She isn’t as operatic as some power metal vocalist (thankfully!) but she definitely has a great high range and her lower range is balanced well. Rather than a constant falsetto enough to break glass she shouts but its tightly controlled and even. In short, she is a hell of a vocalist with a killer attack and none of the corny vibrato. I really like the arrangements of the songs—they have an epic atmosphere to them but it never strays off to far, instead staying within the confides of a straight ahead metal sound. “The Traveler/Dark Warrior,” starts off with some clean instruments, giving just enough of a thematic edge of the song before it nails its metal opening with Marie’s insane wail. I do feel like her vocals sometimes over power the music, which is common in this genre, but that may be because of the somewhat thin guitar tone. Geoff Waye is a great guitarist but its sometimes a strain to hear him among the vocals and raging drums. “The Traveler/Dark Warrior” is filled with some great riffs and a blazing guitar solo. Waye is really adept at using solos to bridge gaps of the songs without showing off too much. Going back to the drums, Angelopoulos is a beast on the kit. He has the intensity found in the best power metal bands but he has other approaches that throw in some thrash and even some old school flair. “Crossing the Avalon,” echoes some old school IRON MAIDEN in the riffs but some of the random sounding bass effects take away from the moment, especially in the bass which is played expertly but it sounds a bit out of place here at time. Still it is a speedy song with a constant barrage of riffs and a galloping effect. Once again, we are treated to a badass guitar solo that really works well with the soaring vocals behind it. Talking about the bass more, Jackman is without a doubt the star of this album and I think he is a bit more talented than the rest of the band, at least in terms of stepping outside the box and letting it all out. His bass is punchy, melodic, and full of wild energy but sometimes it feels like his sound is stretched further than needed when some of the more aforementioned flamboyant effects pop up. This is a solid effort that avoids the sophomore slump so common with bands and I’m excited to hear what they will be able to come up with in the future.